Drunk driving charges are aggressively prosecuted in the Marin County Superior Court. Historically, the Marin County District Attorney had a strict policy of never offering plea bargains on DUI offenses. In recent years, however, Marin prosecutors have eased up on that hardline approach and now offer plea reductions in some circumstances. They have by no means gotten soft on DUI prosecutions, however, and if you or loved one have been arrested for drunk driving in Marin County, you should retain an experienced DUI defense attorney--a San Rafael lawyer who specializes in DUI defense and has a working relationship with the judges and prosecutors. This is the key to avoiding a conviction or at least minimizing the consequences of one. For over three decades, Burglin Law Offices, P.C. has successfully represented drivers charged with DUI in Marin County and throughout the San Francisco Bay Area. Attorney Paul Burglin is the only lawyer in Marin County Board-Certified in DUI Defense (as recognized by the American Bar Association). 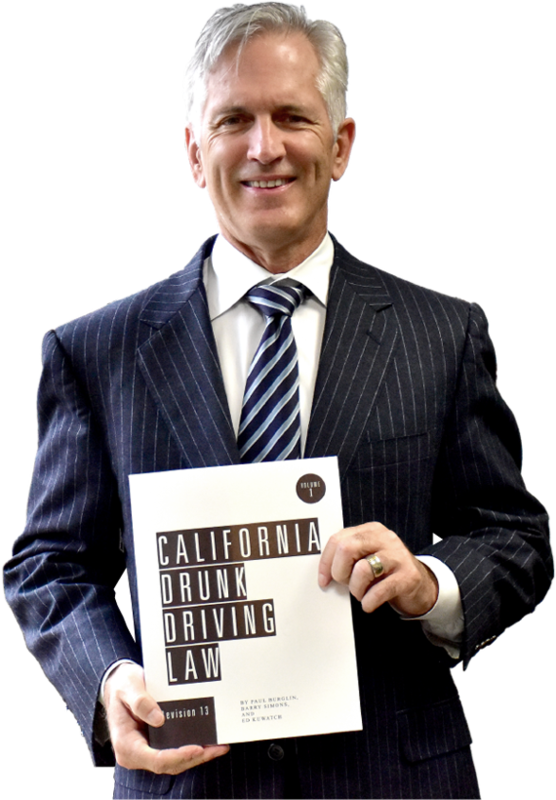 He co-authors California Drunk Driving Law, a two-volume legal treatise which you will find in the Marin County Law Library and every courthouse in California. Paul and his family are locals. They make their home in Kentfield, and their office is conveniently located in San Rafael. Paul is highly regarded by his peers as one of the most experienced and accomplished DUI defense attorneys in all of California. His depth of knowledge and strong track record of success are major reasons he is frequently sought out by prosecutors, judges, and DMV hearing officers when someone close to them is in legal trouble for allegedly driving under the influence. DUI penalties in California are set by state statutes. However, each county has its own policies about how these laws are enforced and what sentences are typically imposed. The District Attorney's office in Marin County operates under some very unique and stringent guidelines regarding prosecution, plea bargaining, reduction of charges, jail time, and other drunk driving penalties. Being pulled over for DUI in California is a traumatic experience. The laws are strict, and penalties for a conviction can be very harsh. If you are charged with drunk driving in Marin County, you may be facing even tougher penalties. The District Attorney's office is known for not negotiating plea bargains with even first-time offenders. Marin County is notorious for its tough prosecution of DUI cases. Since the 1970s, the District Attorney's office has had a "no negotiation" policy. This means that they will not typically negotiate a plea bargain to allow you to plead "no contest" or have your DUI charge reduced to a "wet reckless". AM I OVER THE LEGAL BLOOD ALCOHOL LIMIT? In California, a driver can be arrested for driving under the influence of alcohol (DUI) if their blood alcohol content (BAC) level is .08% or more. However, there are a variety of factors that can influence whether a person's BAC is above the legal limit, including their gender, their weight, the number and type of drinks they have consumed, and the amount of time that has passed. By using the calculator below, you can get an estimate of your BAC and determine whether you can legally drive after drinking. If you are arrested for drunk driving in Marin County with a blood alcohol concentration (BAC) level of .08 or higher, you will likely be charged with violating both Section 23152(a) and 23152(b) of the California Vehicle Code, and you will face an automatic driver's license suspension. A conviction can result in heavy fines and penalties, community service, mandatory DUI school, attendance at AA meetings, installation of an ignition interlock device, even jail time. You may also be looking at other consequences, such as higher insurance rates, difficulty obtaining housing, loans, and college admission, and even the loss of a professional license. Being charged for DUI in Marin County can be costly both now and in the future. Attorney Paul Burglin understands what is at stake, and he works hard to provide the skilled defense you need to mitigate your situation as much as possible. For a discreet and confidential consultation with attorney Paul Burglin, contact our office today at 415-729-7300. We serve clients throughout the San Francisco Bay Area and Marin County, including San Rafael, Corte Madera, Novato, Sausalito, Lagunitas, Belvedere, Bolinas, Dillon Beach, Fairfax, Forest Knolls, Greenbrae, Ignacio, Inverness, Kentfield, Larkspur, Marshall, Mill Valley, Muir Beach, Nicasio Valley, Olema, Point Reyes Station, Ross, San Anselmo, San Geronimo, Stinson Beach, Tiburon, Tomales, and Woodacre.